A visionary Thai director returns with a haunted, lovely drama about connecting souls. Apichatpong Weerasethakul’s latest film may not resound with the same cosmic heft of his mythical love story Tropical Malady (2004) or his Palme d’Or–winning Uncle Boonmee Who Can Recall his Past Lives (2010), but this profoundly quiet sigh of regret is nevertheless the work of a master artist who’s become fluent with his muse. 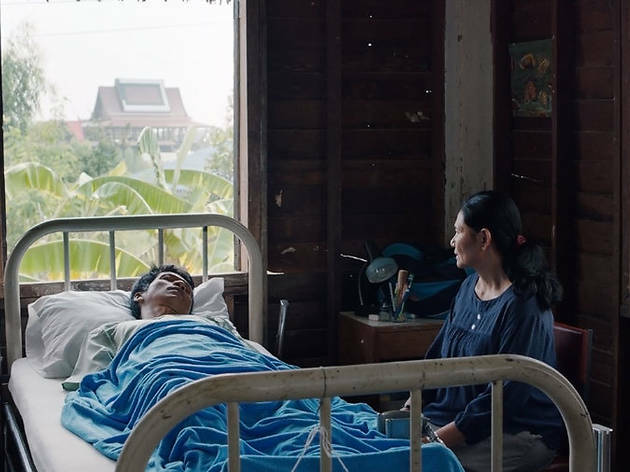 Shot in the months before Thailand’s most recent military coup and set in a remote clinic that was supposedly built atop a burial ground for the country’s ancient kings, Cemetery of Splendor occupies the sad limbo between imminent strife and past trauma. The story, such as it is, concerns a group of soldiers who’ve been felled by a strange outbreak of sleeping sickness and the mystic bond that forms between an openhearted volunteer nurse named Jenjira (Weerasethakul veteran Jenjira Pongpas Widner) and Itt (Banlop Lomnoi), the patient who’s roused into the waking world by her tender care. Their relationship is strictly platonic—Weerasethakul’s films are less interested in romance than spiritual communion—but it opens the door for both of them to connect with the ghosts that so gently leave their fingerprints on the present. Delicately placed on a sonic bedrock of chirping birds and distant traffic, Cemetery of Splendor is a whisper of a film that can only cast its spell if you let your breathing slow and give yourself over to the urgency of its spectral dimension. And don’t worry if you fall asleep—this is a beautiful movie about the things we can’t see with our eyes open.